Mani Feniger’s new memoir, The Woman in the Photograph, is a compelling narrative set in motion by an unexpected meeting with history. With the fall of the Berlin Wall, the door to her mother’s vanished past sprang open and what she discovered irrevocably changed her life. 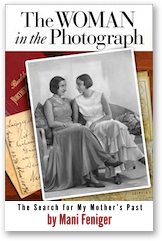 Mani Feniger talks with Ruthanne Shpiner about her book, which documents her quest to learn about her mother's life in Europe after finding an old photo. 11:46 min. Kate Raphael talks with Valori George and Kathleen Russell about the strange case of Eva Ruiz Gomez and the corruption and bias in the family court system. For updates and to help support Eva's case go to her website at www.friendsofeva.org. Unfortunately many women and children have become victims of a family court whose reigning paradigm is showing an unwarranted bias toward giving the father shared custody, whether or not the he has a proven record of responsible and primary parenting, even in cases where the father has been abusive toward the child or the mother. For more information on the protection of family and children's rights in the court system go to Center for Judicial Excellence. 44:41 min. Listen to the entire show as aired on KPFA. 59 min. Eva and her supporters have told the media so many lies and half truths in an attempt to gain sympathy and circumvent the legal system. Its about time someone speak up on behalf of the father, Mr. Munoz. Up until now, no one has spoken on behalf of Mr. Munoz because of the best interest of the child. Eva and her supporters continue to exploit the child in the media and use the child for leverage in the media. The true victim is the child not Eva! Eva has made so many false allegations about Mr. Munoz being abusive and a dead beat father. Eva never mentioned any abuse when Mr. Munoz first filed for visitation in the early 2000s. Eva only made the abuse allegations after criminal charges were filed against her. Eva even left her then young daughter from a previous relationship in the care of Mr. Munoz. In the early 2000s Mr. Munoz filed for visitation knowing he would have to pay child support. Mr. Munoz only wanted to be part of his son's life and have a relationship with his son. Mr. Munoz recontacted local law enforcement when he learned Eva was back in the country and in the local area. If Mr. Munoz was so opposed to paying child support why would he contact authorities knowing the child support payments would resume. Anyone who pays child support knows that you cannot simply walk into the child support office and stop child support payments. The child support dept. stopped Mr. Munoz's child support payments when they learned Eva was in Mexico. They told Eva she would personally have to come in to their office to handle the matter. Eva never went to the chid support offices, even after she returned from Mexico. Perhaps she did not want to be located. She only made an issue of the child support after criminal charges were filed against her. Eva made the decision for her son to keep him from his father. The child was never able to choose for himself. Mr. Munoz will never get back the years he has lost with son. Although the wheels of justice are slow, justice will prevail. Eva must be held accountable for the damage she has done! The views herein expressed are mine alone and do not necessarily reflect the views of Ramon, his attorney or any other person.